OIdie, but a goodie. Dilbert is diagnosed with "the knack" at a young age. But will he have a normal life? No... He'll be an engineer! Looks like Les has "the knack". 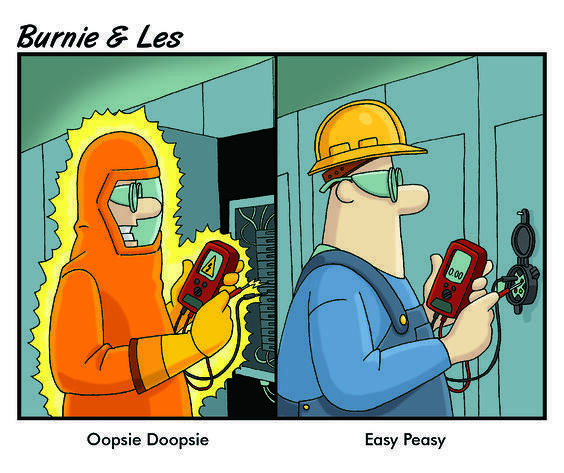 Burnie's situation could have been easily prevented with the SafeSide Voltage Test Point device; a high impedence protected PESD that allows workers to safely measure presence or absence of electrical energy through a metered test without the risk of being exposed to shock and arc flash hazard. Not everyone is born with the knack! Fortunately, we offer products to level the playing field. Stay tuned for more information on this new product! This special report provides an overview of the three principal types of electrical hazard analysis, along with a discussion of the relevant standards and regulations pertaining to the subject. The need for analyzing electrical hazards in the workplace has been recognized by a small segment of the industry for years. The petrochemical industry and government institutions have performed research on this subject. For the most part, however, the electrical industry, at least at the user level, has largely ignored the subject, essentially reacting to catastrophic accidents rather than proactively trying to predict and prevent them.